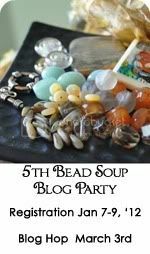 Looking for the Bead Soup Blog Party? Click Here! Ever since getting my Samsung Galaxy S2, I've been downloading apps like crazy. There are many good apps that I found were useful in helping me organize my business. So I thought I'd review some of these android apps (although some have an iphone equivalent) that I think are useful for business, beading or just really cool! I'll try to post a new review every month. Here goes the first one! Evernote was one of those apps that was raved about on Google Play. It was on the front page whenever I go into Google Play and I kept seeing ads about it. So I finally decided to give it a try. At first, I thought it was just a mobile app but soon realized that it could be downloaded onto your computer and other devices. It is best used on the computer to gather all your info and then its available on your phone. The phone app is used for gathering quick ideas on the run. I find that it works best when you create the more complicated notes (like creating a blog hop checklist) on the computer then use it on your phone. Some of the simpler functions like typing a note, taking a snapshot, voice recording etc. can easily be done on your phone. 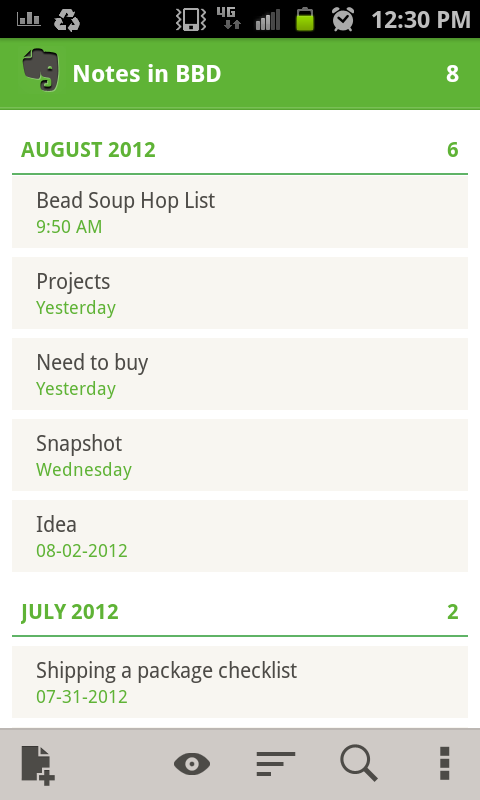 The most useful thing I've done with this app is create a blog hop checklist of all the participants. From the computer, I copy and paste the entire list right from my blog. Then (somewhat tedious but not difficult to do) I manually put a check box next to each participants name. Now when I'm not near a computer I can still hop to a few blogs on my phone. 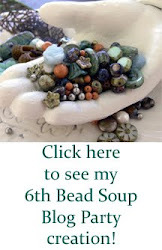 Bead Soup list of participants. 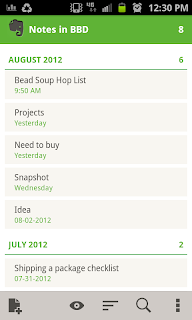 Overall, Evernote is a great app to use for organizing all your ideas and notes in one place. As you can see in my second picture (look up) I created lists of items I need to buy and ideas. I can record my ideas when on my phone and then sync it and it'll be on my computer if I need it. And did I mention you can access your files from the web. So if you're at another computer, you won't need to download the program. Keep track of ideas that float through my head during the day or take a snapshot of something that inspires me for a beading project. Make a list of projects that I need to finish so it doesn't keep swimming around in my head bothering me. Clip websites with ideas and tips about running a craft show. Create a checklist of all the participants in the Bead Soup Blog Hop so that I can check each person off as I visit their site. Best part is that I can do this all on my phone! What do you think? Do you use Evernote? Let me know in the comments below and/or click one of the reactions. The day has finally come. It's party time! So sit back, drink some tea and enjoy some delicious bead soup. 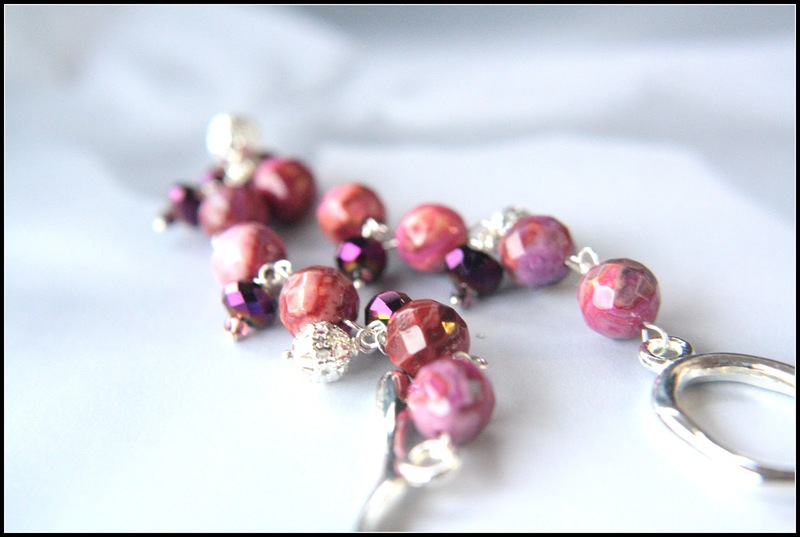 My partner, Sandra Young, sent me this yummy purple-y, pink soup of beads. 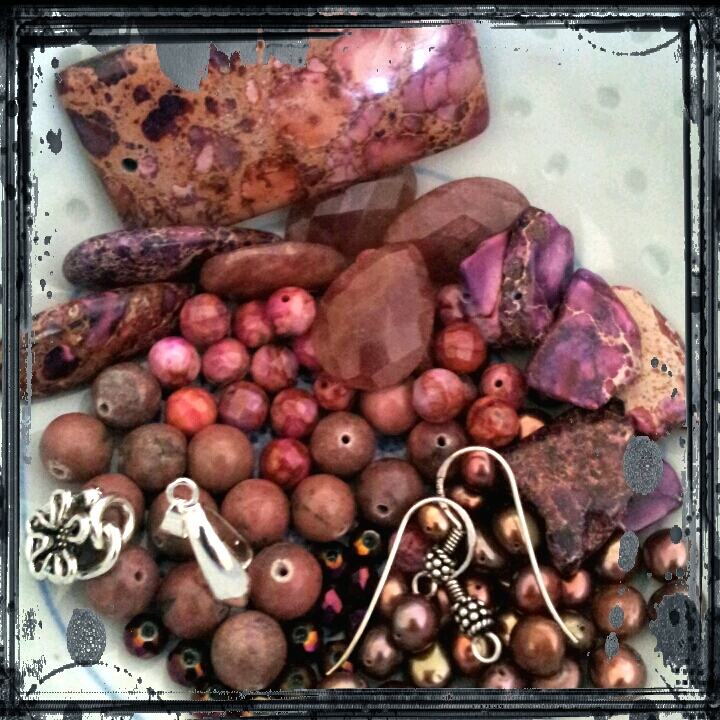 It consisted of a Jasper focal, flower clasp and many other lovely goodies. I wanted to use the focal and clasp on one piece. The Jasper pendent looked best by itself. At least I thought so. 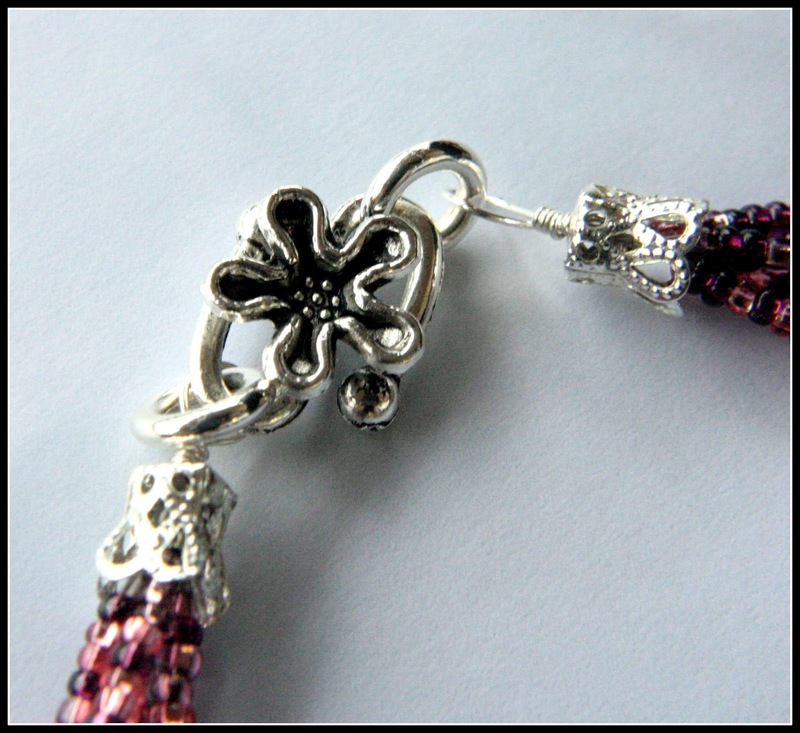 At first, I put the focal on a silver chain and attached it to the flower clasp but what kind of challenge was that. It was too simple of a design that I scraped it. Then this piece went through several more changes before I ended up using Amethyst seed beads that I got a long time ago at a bead show. I was going to add some of the faceted crazy lace agate but I didn't like how it went. I thought it best to keep the design simple because that's how I like it. Why complicate it with more beads when it looks great already. 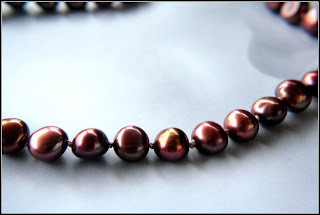 The next necklace I made uses the really cute button shaped freshwater pearls. I love pearls! So for this piece I decided to hand knot the pearls using silk thread. At the ends I used matte Japanese square beads and attached it to a heart clasp that I've been trying to use for a while (the heart shaped was so small most of the beads I used wouldn't fit, therefore the toggle wouldn't go through). I just love the button pearls. I think they're really cute. It's also very light to wear. 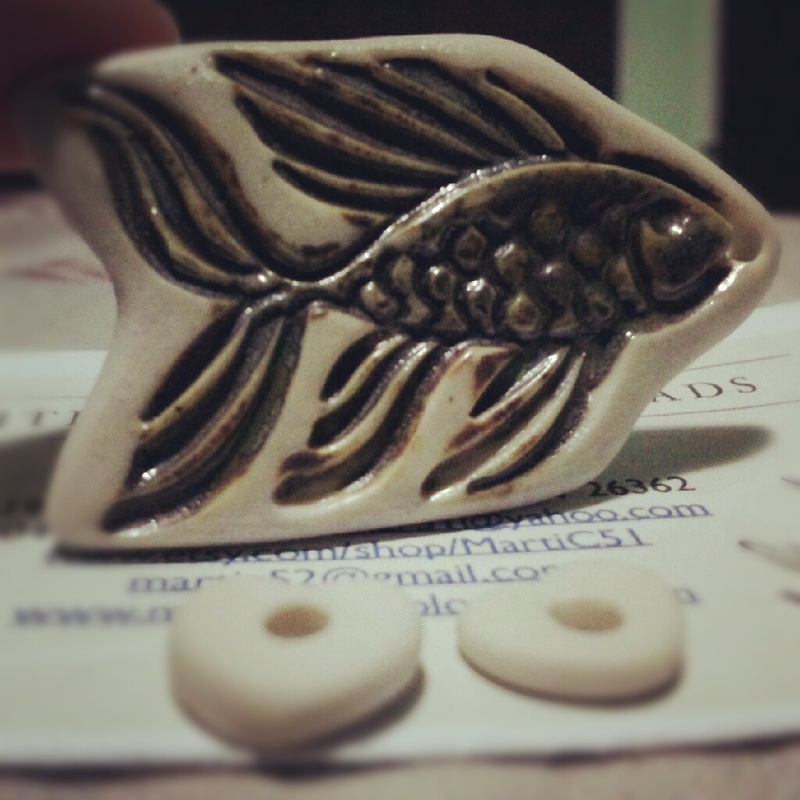 My next two pieces are earrings. The first pair I used some copper wire and wire wrapped two of the Muscavite brios. 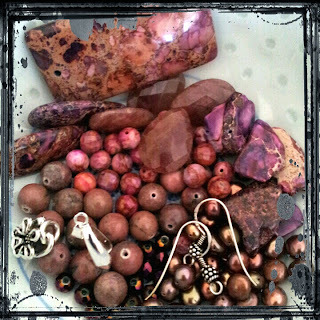 Then I added the rhodonite rounds to make it dangle some more. These are my favourite pair of earrings. 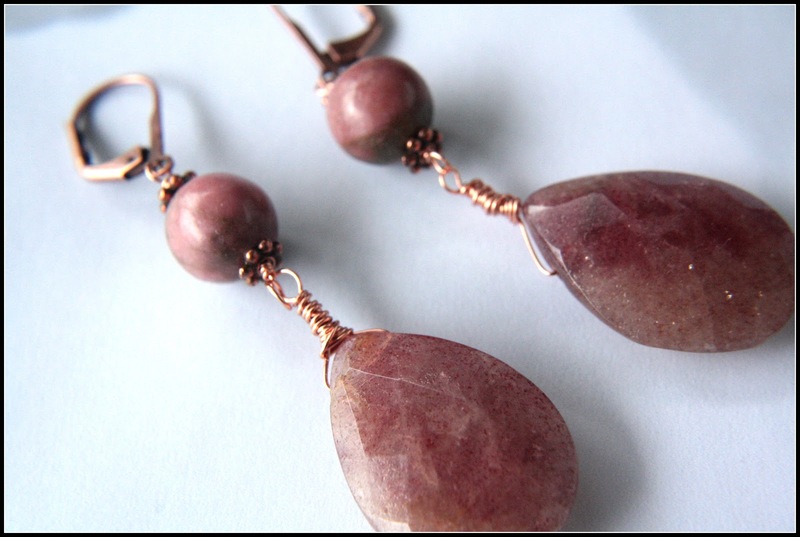 When I first saw these Jasper drops I knew I was going to make them into earrings with the earring wires from Sandra. I love these! It has a little shine to them with the purple crystals. 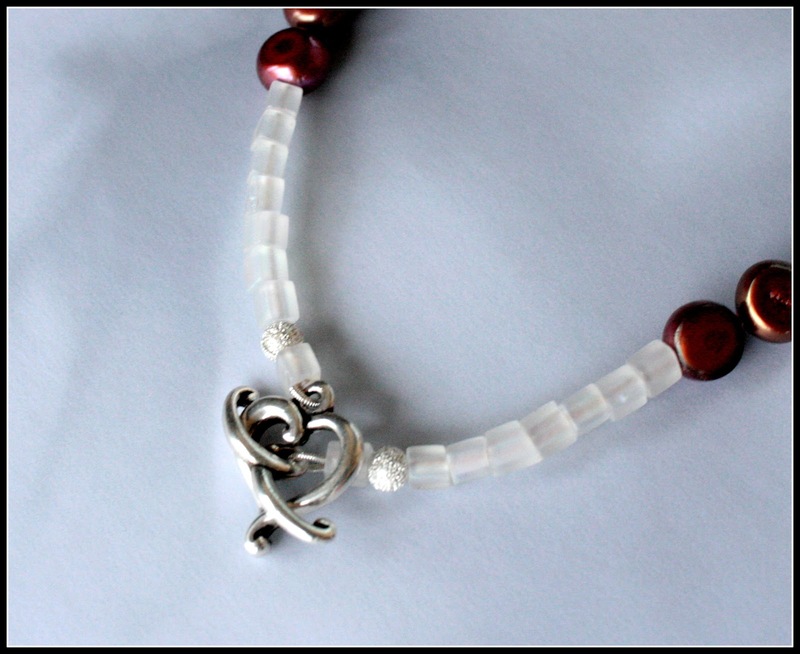 My last piece is a dangle bracelet with the agate beads mixed with the purple crystals and some silver beads from my own stash. And that's it! I hope you enjoyed that! 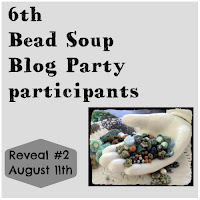 This is my second time participating in the Bead Soup Blog Party and it has been a blast! I just want to thank Lori Anderson for hosting this year after year. It takes a lot of work pairing everyone up and organizing the hop. Also, thank you to Sandra, my partner for the lovely mix, I got to work with. Come see what she created with the soup I gave her. Another really nice lady, Tanya of FusionMuse Thomas Pautler, created this site which lists all the participants from all three reveals. Be sure to check out some really talented artists. Now it's time to hop on to Sandra's blog before I go to everyone else's. Have fun! 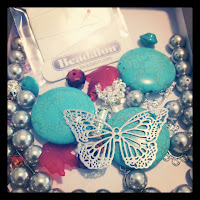 Tracy Choy, BumbleBeads Designs <-----You are here! 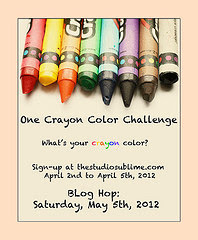 Click HERE to see participants from the other reveal dates! My "studio" started its humble beginnings in boxes and containers. I didn't have very much so it worked. It would be mobile so that I could bring it from my room to the living room and create while watching TV. I've always liked this arrangement except it caused me back and shoulder pain from looking down (I also like to sit on the floor, still do actually). All my beads would be all over the carpet and was a safety hazard for people walking around. It was also a terrible mess! 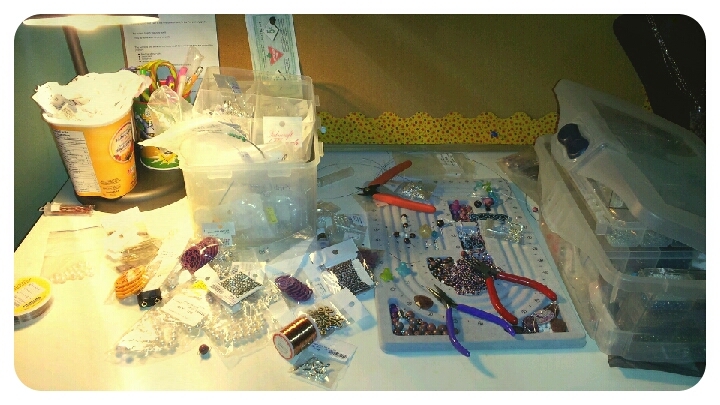 So..... last week I decided to clear out a table in our bedroom that would solely be dedicated to beading. And during the school year, I can use it for school work. That solved the mess and back pain issues.